This exceedingly rare lens is now available here at MP&E. 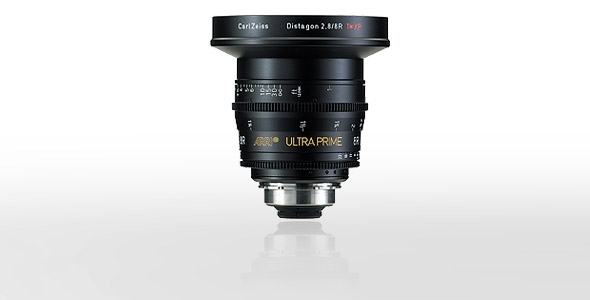 The Arri Zeiss Ultra Prime 8R/T2.8 is an extreme wide angle lens with a unique look unparalleled by any other lens in the film or video world. Because of its rectilinear design it shows an extremely wide angle of view without any of the commonly associated fisheye distortions. Length (lens mount to front) 130 mm/5.1"
(1) Horizontal angle of view for an ANSI Super 35 Silent camera aperture (aspect ratio 1:1.33, dimensions 24.9 mm x 18.7 mm / 0.980" x 0.7362"). Ground glasses available for ARRICAM, ARRIFLEX 235 and all 435 and 535 models. (2) Horizontal angle of view for a DIN Super 35 Silent camera aperture (aspect ratio 1:1.33, dimensions 24 mm x 18 mm / 0.944" x 0.7087"). Ground glasses available for ARRIFLEX 235 and all 435 and 535 models. (3) Horizontal angle of view for a Normal 35 Academy camera aperture (aspect ratio 1:1.37, dimensions 22 mm x 16 mm / 0.8661" x 0.6299"). Ground glasses available for ARRICAM, ARRIFLEX 235 and all 435 and 535 models. (4) l' is the radius of the image circle needed for the respective format. It is the same as the distance from the image center to a corner.